Sanjay Leela Bhansali's upcoming film Padmavati starring Deepika Padukone, Ranveer Singh and Shahid Kapoor is one of the most awaited films in Bollywood currently. Padmavati is based on the life and times of Rajput princess Padmini of Chittaurgarh, who was world renowned for her beauty and her Rajput dignity. Shahid Kapoor, who will be seen as King of Chittaurgarh and Padmini's husband, Rana Rawal Ratan Singh, has been preparing for his role with utmost sincerity. There were pictures doing the rounds online of the actor practicing sword-fighting along with Sunil Kumar, a martial arts artiste and Kalaripayattu expert. Kumar is known to train actors in sword fighting for films. His past collaborations include Jackie Chan for The Myth, Shah Rukh Khan like Dil Se and Asoka, Ajay Devgn for Lajja, Abhishek Bachchan and Vikram for Raavan and much recently Ranveer Singh for Bhansali's Bajirao Mastani, reports Mumbai Mirror. Kumar has been supervising Kapoor's training for Padmavati as well. Kapoor first began his training trained with sticks, which were later replaced by real combat weapons like daggers, swords, spears and flexible swords. Kapoor has also been undergoing training in defense tactics along with combat training. While all his previous training had artificial weapons, the one, in pictures above) includes use of real swords and shields, adds the Mumbai Mirror report. The Times of India, in one of its reports, states that Kapoor has been training for the film for quite some time now and he has been practising six different forms of swordsmanship. He reportedly got a personal trainer to train him, so that he could add finesse to his performance in the film. 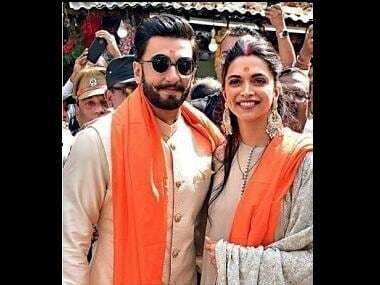 Padmavati stars Padukone in the role of Padmini who in order to protect her dignity and falling in the hands of foreign invader Allauddin Khilji (played by Ranveer Singh) opts for self-immolation by jumping into a burning pyre. The film co-produced by Viacom 18 along with Bhansali is slated to release on 17 November this year.